زاهدی, رویا, افشار طارمی, فرامرز, جم جاه, رقیه. (1396). تأثیر الکترون دهنده های بیرونی نوین اتری و سیلانی رایج بر کاتالیست های نسل چهارم زیگلر ـ ناتا برای پلیمریزاسیون پروپیلن. نشریه شیمی و مهندسی شیمی ایران, 36(3), 21-39. رویا زاهدی; فرامرز افشار طارمی; رقیه جم جاه. "تأثیر الکترون دهنده های بیرونی نوین اتری و سیلانی رایج بر کاتالیست های نسل چهارم زیگلر ـ ناتا برای پلیمریزاسیون پروپیلن". نشریه شیمی و مهندسی شیمی ایران, 36, 3, 1396, 21-39. زاهدی, رویا, افشار طارمی, فرامرز, جم جاه, رقیه. (1396). 'تأثیر الکترون دهنده های بیرونی نوین اتری و سیلانی رایج بر کاتالیست های نسل چهارم زیگلر ـ ناتا برای پلیمریزاسیون پروپیلن', نشریه شیمی و مهندسی شیمی ایران, 36(3), pp. 21-39. زاهدی, رویا, افشار طارمی, فرامرز, جم جاه, رقیه. تأثیر الکترون دهنده های بیرونی نوین اتری و سیلانی رایج بر کاتالیست های نسل چهارم زیگلر ـ ناتا برای پلیمریزاسیون پروپیلن. 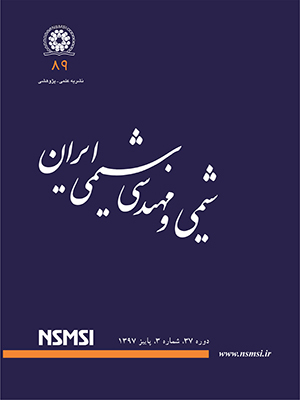 نشریه شیمی و مهندسی شیمی ایران, 1396; 36(3): 21-39. در این پژوهش، پنج ترکیب اتری با تعداد گروه ­های متوکسی گوناگون از طریق واکنش ویلیامسون سنتز شدند. این ترکی ب­های اتری به وسیله فناوری­های 1HNMR، 13CNMR و FT-IR شناسایی شدند و سپس به­ عنوان الکترون ­دهنده­ های بیرونی برای پلیمریزاسیون پروپیلن با کاتالیست زیگلر ـ ناتا برای مقایسه با سیکلوهگزیل­متیل ـ دی­ متوکسی سیلان و دی­ سیکلو پنتیل­ دی ­متوکسی سیلان به کار برده شدند. پلیمریزاسیون پروپیلن با استفاده از کاتالیستزیگلر ـ ناتا بر پایه­ منیزیم دی­ کلرید (4TiCl/ID/2MgCl) شامل الکترون ­دهنده ­ی درونی از نوع فتالات، در حضور کمک ­کاتالیست آلومینیم تری­اتیل و هیدروژن با الکترون­ دهنده ­های بیرونی، برای مقایسه ­ی تأثیر ترکیب ­های اتری و سیلانی بر خواص پلی­پروپیلن انجام شد. نقش این ترکیب­های اتری و آلکوکسی­ سیلان­ های صنعتی روی ویژگی­ های پلی ­پروپیلن با استفاده از روش انحلال­ پذیری در اورتوزایلن، شاخص جریان مذاب و گرماسنجی پویشی تفاضلی مطالعه شد. میزان تولید، بلورینگی و ایزوتاکتیسیته­ی پلی­پروپیلن به ­دست آمده، به وسیله الکترون­ دهنده­ های بیرونی تأثیر می ­پذیرند.همچنین ساختار کاتالیست صنعتی زیگلر – ناتا و پلی ­پروپیلن­ های تولید شده با این کاتالیست در حضور الکترون­ دهنده ­های بیرونی گوناگون، به­ وسیله ­ی میکروسکوپ الکترونی پویشی (SEM) تعیین شدند. Kissin Y., “Alkene Polymerization Reactions with Transition Metal Catalysts”, Elsevier Science, Amsterdam, Netherlands (2008). Bazhenov A., Linnolahti M., Pakkanen T. A., Denifl P., Leinonen T., Modeling the Stabilization of Surface Defects by Donors in Ziegler–Natta Catalyst Support, J. Phys. Chem. C., 118 (9): 4791-4796 (2014). Alshaiban A., Soares J. B., Effect of Hydrogen, Electron Donor, and Polymerization Temperature on Poly(propylene) Microstructure, Macromol. Symp., Wiley Online Library, 312: 72-80 (2012). Claverie J. P., Schaper F., Ziegler-Natta Catalysis: 50 Years After the Nobel Prize, MRS Bull., 38(03): 213-218 (2013). Gnanakumar E. S., Gowda R. R., Kunjir S., Ajithkumar T., Rajamohanan P., Chakraborty D., Gopinath C. S., MgCl2.6CH3OH: A Simple Molecular Adduct and Its Influence As a Porous Support for Olefin Polymerization, ACS Catal., 3(3): 303-311 (2013). Gnanakumar E. S., Thushara K., Bhange D. S., Mathew R., Ajithkumar T., Rajamohanan P., Bhaduri S., Gopinath C. S., MgCl2.6PhCH2OH - A New Molecular Adduct as Support Material for Ziegler–Natta Catalyst: Synthesis, Characterization and Catalytic Activity, Dalton Trans., 40(41): 10936-10944 (2011). Correa A., Credendino R., Pater J. T., Morini G., Cavallo L., Theoretical Investigation of Active Sites at the Corners of MgCl2 Crystallites in Supported Ziegler-Natta Catalysts, Macromol., 45(9): 3695-3701 (2012). Groppo E., Seenivasan K., Barzan C., The Potential of Spectroscopic Methods Applied to Heterogeneous Catalysts for Olefin Polymerization, Catal. Sci. Tech., 3(4): 858-878 (2013). Stukalov D. V., Zakharov V. A., Potapov A. G., Bukatov G. D., Supported Ziegler–Natta Catalysts for Propylene Polymerization. Study of Surface Species Formed at Interaction of Electron Donors and TiCl4 with Activated MgCl2, J. Catal., 266 (1): 39-49 (2009). Bazhenov A. S., Denifl P., Leinonen T., Pakkanen A., Linnolahti M., Pakkanen T. A., Modeling Coadsorption of Titanium Tetrachloride and Bidentate Electron Donors on Magnesium Dichloride Support Surfaces, J. Phys. Chem. C, 118(48): 27878-27883 (2014). Dil E. J., Pourmahdian S., Vatankhah M., Afshar-Taromi, F., Effect of Dealcoholation of Support in MgCl2-Supported Ziegler–Natta Catalysts on Catalyst Activity and Polypropylene Powder Morphology, Polym. Bull., 64 (5): 445-457 (2010). Chumachenko N.; Zakharov V.; Bukatov G.; Sergeev S., A Study of the Formation Process of Titanium-Magnesium Catalyst for Propylene Polymerization, Applied Catalysis A: General, 469: 512-516 (2014). Li P., Tu S., Xu T., Fu Z., Fan Z., The Influence of Combined External Donor and Combined Cocatalyst on Propylene Polymerization with a MgCl2‐Supported Ziegler–Natta Catalyst in the Presence of Hydrogen, J. App. Polym. Sci., 132 (12): 41689-41696 (2015). Zakirov M., Kleiner V., Adrov O., Nifant’ev I., Shklyaruk B., Stroganov V., Nedorezova P., Klyamkina A., Effect of Electron Donors on Polymerization of Propylene in the Presence of Titanium-Magnesium Catalysts, Polym. Sci. Ser. B, 52(9-10): 584-588 (2010). Kim S. Y., Hiraoka Y., Taniike T., Terano M., In External Donor Induced Direct Contact Effects on Mg(OC2H5)2‐Based Ziegler‐Natta Catalysts for Propylene Polymerization, Macromol. Symp., Wiley Online Library, 285 (1): 115-120 (2009). Zhang H. -X., Lee Y. -J., Park J. -R., Lee D. -H., Yoon, K. -B., Control of Molecular Weight Distribution for Polypropylene Obtained by Commercial Ziegler-Natta Catalyst: Effect of Temperature, Polym. Bull., 67(8): 1519-1527 (2011). Alshaiban A., Soares J. B., Effect of Hydrogen and External Donor on Propylene Polymerization Kinetics with a 4th‐Generation Ziegler‐Natta Catalyst, Macromol. React. Eng., 6(6‐7): 265-274 (2012). Zhang H. -X., Lee Y. -J., Park J. -R., Lee D. -H., Yoon K. -B., Control of Molecular Weight Distribution for Polypropylene Obtained by Commercial Ziegler-Natta Catalyst: Effect of Electron Donor, Macromol. Res., 19(6): 622-628 (2011). Da Silva Filho A. A., Alves M., do Carmo M., dos Santos J. H. Z., XPS and EXAFS Characterization of Ziegler-Natta Catalyst Systems, J. Appl. Polym. Sci., 109(3): 1675-1683 (2008). Lee J. W., Jo W. H., Chemical Structure Stereospecificity Relationship of Internal Donor in Heterogeneous Ziegler–Natta Catalyst for Propylene Polymerization by DFT and MM Calculations, J. Organomet. Chem., 694 (19): 3076-3083 (2009). Qiao J., Guo M., Wang L., Liu D., Zhang X., Yu L., Song W., Liu Y., Recent Advances in Polyolefin Technology, Polym. Chem., 2 (8): 1611-1623 (2011). Vanka K., Singh G., Iyer D., Gupta V. K., DFT Study of Lewis Base Interactions with the MgCl2 Surface in the Ziegler-Natta Catalytic System: Expanding the Role of the Donors, J. Phys. Chem. C, 114(37): 15771-15781 (2010). Zhang H.-x., Shin Y.-j., Lee D.-h., Yoon K.-B., Preparation of Ultrahigh Molecular Weight Polyethylene with MgCl2/TiCl4 Catalyst: Effect of Internal and External Donor on Molecular Weight and Molecular Weight Distribution, Polym. Bull., 66 (5): 627-635 (2011). Dashti A., Ramazani S., Hiraoka Y., Kim S. Y., Taniike T., Terano M., In Kinetic and Morphological Investigation on the Magnesium Ethoxide‐Based Ziegler‐Natta Catalyst for Propylene Polymerization Using Typical External Donors, Macromol. Symp., Wiley Online Library, 285 (1): 52-57, 2009. Andoni A., Chadwick J.C., Milani S., Niemantsverdriet H.J., Thüne P.C., Introducing a New Surface Science Model for Ziegler-Natta Catalysts: Preparation, Basic Characterization and Testing, J. Catal., 247(2): 129-136 (2007). Gao M., Liu H., Wang J., Li C., Ma J., Wei G., Novel MgCl2-Supported Catalyst Containing Diol Dibenzoate Donor for Propylene Polymerization, Polym., 45 (7): 2175-2180 (2004). Song B. G., Ihm S. K., The Role of Two Different Internal Donors (phthalate and 1,3‐diether) on the Frmation of Surface Structure in MgCl2‐Supported Ziegler–Natta Catalysts and Their Catalytic Performance of Propylene Polymerization, J. App. Polym. Sci., 131 (15): 2014. Capone F., Rongo L., D’Amore M., Budzelaar P. H., Busico V., Periodic Hybrid DFT Approach (Including Dispersion) to MgCl2-Supported Ziegler–Natta Catalysts. 2. Model Electron Donor Adsorption on MgCl2 Crystal Surfaces, J. Phys. Chem. C., 117 (46): 24345-24353 (2013). Kudinova O., Kron T., Ladygina T., Kozhevnikov A., Petrov E., Novokshonova L., Polydentate Phosphine Oxides as External Electron Donors for Titanium-Magnesium Catalysts for Propylene Polymerization, Kin. Catal., 51 (2): 229-234 (2010). Kang K. K., Shiono T., Jeong Y. T., Lee D. H., Polymerization of Propylene by Using Mg(OEt)2-DNBP-TiCl4 Catalyst with Alkoxy Disilanes as External Donor, J. Appl. Polym. Sci., 71(2): 293-301 (1999). Chang H., Li H., Zheng T., Zhou Q., Zhang L., Hu Y., The Effects of New Aminosilane Compounds as External donors on Propylene Polymerization, J. Polym. Res., 21(9): 1-11 (2014). Zhou Q., Zheng T., Li H., Li Q., Zhang Y., Zhang L., Hu Y., Effects of Some New Alkoxysilane External Donors on Propylene Polymerization in MgCl2-Supported Ziegler-Natta Catalysis, Ind. Eng. Chem. Res., 53(46): 17929-17936 (2014). Wang Q., Murayama N., Liu B., Terano M., Effects of Electron Donors on Active Sites Distribution of MgCl2‐Supported Ziegler‐Natta Catalysts Investigated by Multiple Active Sites Model, Macromol. Chem. Phys., 206(9): 961-966 (2005). Taniike T., Wada T., Kouzai I., Takahashi S., Terano M., Role of Dispersion State of Ti Species in Deactivation of MgCl2-Supported Ziegler-Natta Catalysts, Macromol. Res., 18(9): 839-844 (2010). Vestberg T., Denifl P., Parkinson M., WilÉN C. E., Effects of External Donors and Hydrogen Concentration on Oligomer Formation and Chain end Distribution in Propylene Polymerization with Ziegler‐Natta Catalysts, J. Polym. Sci., Part A: Polym. Chem., 48(2): 351-358 (2010). Shen X. -R., Fu Z. -S., Hu J., Wang Q., Fan Z. -Q., Mechanism of Propylene Polymerization with MgCl2-Supported Ziegler-Natta Catalysts Based on Counting of Active Centers: The Role of External Electron Donor, J. Phys. Chem. C, 117(29): 15174-15182 (2013). Phiwkliang W., Jongsomjit B., Praserthdam P., Synergistic Effects of the ZnCl2-SiCl4 Modified TiCl4/MgCl2/THF Catalytic System on Ethylene/1-Hexene and Ethylene/1-Octene Copolymerizations., Chin. J. Polym. Sci., 32 (1): 84-91, (2014). Zahedi R., Afshar Taromi F., Mirjahanmardi S. H., Nekoomanesh Haghighi M., Jadidi K., Jamjah R. Propylene Polymerization over MgCl2‐Supported Ziegler–Natta Catalysts Containing Tri‐Ether as the Internal Donor, Adv. Poly. Tech., 37(1): 144-153 (2018). Mirjahanmardi S. H., Taromi F. A., Zahedi R., Haghighi M. N., Effects of Various Amounts of New Hepta-Ether as the Internal Donor on the Polymerization of Propylene with and without the External Donor. Polym. Sci., Ser. B., 59(6): 639-649 (2017). Zahedi R., Taromi F. A., Mirjahanmardi S. H., Haghighi M. N., Jadidi K., Jamjah R. New Penta-Ether as the Internal Donor in the MgCl2-Supported Ziegler-Natta Catalysts for Propylene Polymerization. Chin. J. Polym. Sci., 34(3): 268-279 (2016). Zahedi R., Afshar Taromi F., Mirjahanmardi S. H., Nekoomanesh Haghighi M., Jamjah R., Jadidi Kh., Comparison of the Role of New Ethers and Conventional Alkoxysilanes as External Donors in the Polymerization of Propylene Using the Industrial Ziegler-Natta Catalyst., Polym. Sci. Ser. B., 58 (2):143-151 (2016). Mirjahanmardi S. H., Taromi F. A., Zahedi R., Haghighi M. N., Jamjah R., Asl G. J., Effect of Multi-Ethers and Conventional Alkoxysilanes as External Donors on the 4th Generation Ziegler-Natta Catalysts for Propylene Polymerization, Polym. Sci. Ser. B, 58(6): 619-628 (2016).